A lot can happen in a span of seven days, especially when it comes to the two-wheeler industry. From new launches and sightings to year-end offers, the past week has been an exciting one for bike and scooter enthusiasts alike. So without further ado, here is a glimpse of what made news in India’s two-wheeler space in the week that went by. As news of the Hayabusa’s end trickled in, fans of the much-loved superbike from Suzuki were left disappointed. However, we received confirmation from Suzuki Motorcycle India that the Hayabusa will continue to be sold in India. In fact, bookings for the motorcycle for 2019 have already begun. After Royal Enfield launched the Thunderbird 350 X ABS, it was only a matter of time before the regular Thunderbird got the essential safety net. Royal Enfield has finally launched the Thunderbird 350 ABS at Rs 1.54 lakh (ex-showroom Pune). In fact, the Thunderbird 350 ABS now carries the cheapest premium for a dual-channel ABS in our country. The company has also launched the Thunderbird 500 ABS at Rs. 2.05 lakh (ex-showroom Pune). 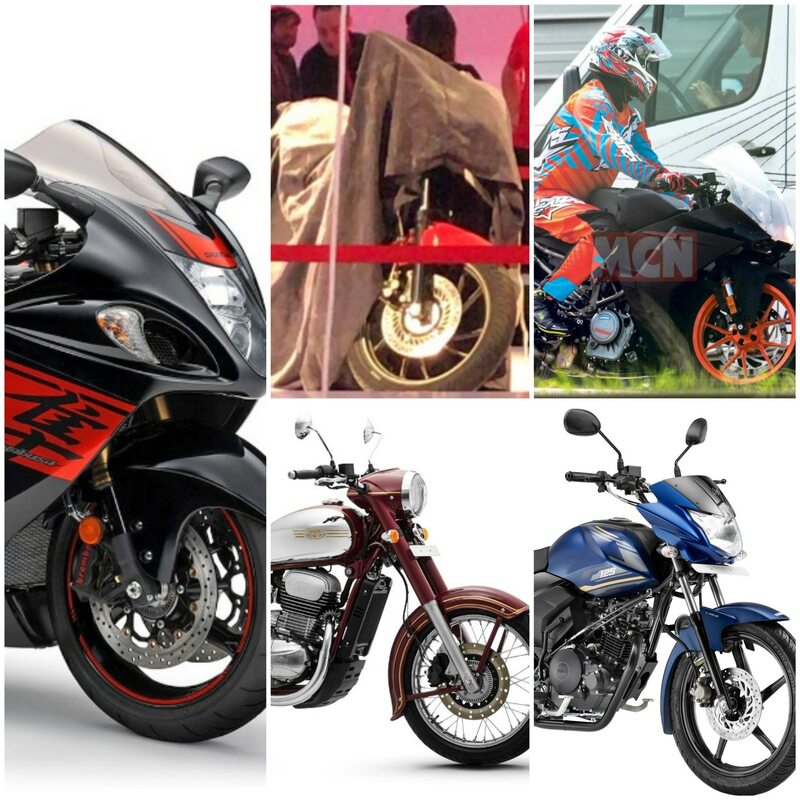 The non-ABS variants of both bikes are likely to be withdrawn gradually. We rode the Jawa twins and finally heard them in all their glory. But more importantly, we also received confirmation that the Jawas twins will soon get dual-channel ABS. This is an important development as many enthusiasts had grumbled about the lack of dual-channel ABS or even a rear disc brake when the Jawa and the Forty Two were first showcased in November. While the inclusion of a dual-channel ABS unit will push up the cost of both bikes, we reckon it is money well spent. The Pulsar 150 is the best-selling bike in its segment and the constant updates that Bajaj makes to the model is a major reason for that. But there has been no news from the company yet on the launch of an ABS variant of the Pulsar 150 in keeping with the upcoming change in safety regulations. But the launch should be around the corner as an ABS-equipped Pulsar 150 has been spotted, again. After the 2017 390 Duke’s launch, all eyes were on KTM to see when the company will unveil the new RC 390. Although KTM did equip the bike with ride-by-wire, a new exhaust and a larger front disc, the wait for an altogether new bike like the 2017 390 Duke continued. That wait could soon be over as the new KTM RC 390 has been spied. We expect the bike to get updated bodywork, underpinnings and a more powerful motor. While official confirmation about the new RC 390 is awaited, the company’s CEO Stefan Pierer has confirmed that KTM is working on a new 500cc twin-cylinder motorcycle that will be manufactured by Bajaj at its Chakan plant. The Karizma is one of the most recognisable names in the Indian motorcycling sphere. The original bike was a huge hit and enjoys a legendary fan following to this day. However, subsequent versions of the bike got an unfavourable response from buyers and enthusiasts alike. But the Karizma name might yet rule Indian roads again as Hero is working on a new Karizma. The bike will be a faired version of the Xtreme 200R and is likely to carry an aggressive price tag. The smallest of the big four Japanese bike manufacturers in India, Kawasaki has nevertheless an impressive portfolio of bikes from different segments. For instance, the company has quite a few offerings in the dirt bike space, with the 2019 KLX 140 being the latest addition. Kawasaki has launched the 2019 KLX 140, a light and powerful full-sized dirt bike aimed at beginners. A Bluetooth-enabled instrument console is among the hottest trends in India’s two-wheeler market and Yamaha is said to be working on bringing the tech to its motorcycles. Which Yamaha bikes will get the feature first? Will it push up the price? When will it debut? We answer all that and more. Last week also saw Yamaha launching the Saluto range of motorcycles with a combined braking setup. The CB1000R+ is a special motorcycle. It offers a trendy neo-retro design that hides a powerful 998cc inline-four motor capable of explosive performance. The new model commands a premium of roughly Rs 1 lakh over the outgoing one. Is it worth the price? We dig deeper to find out. With 2018 coming to a close, a lot of bikes and scooters are getting heavy discounts. Hero dealers are offering discounts on the Maestro Edge and low down payment options on the Glamour. Furthermore, Harley dealers are offering up to Rs 1 lakh cash discount on select models, including the Street 750 and the Street Rod. Not to be left behind, the BMW Motorrad G 310 twins get enticing discounts as well. With the move, BMW hopes to boost sales of its entry-level bikes.